There are plenty of ways to raise money, but one of the most popular (and let’s face it: fun!) ways to bring in fundraising dollars and engage supporters is the time-tested fundraising event. While the payoff can be amazing, there’s no denying the careful planning and hard work that goes into creating a memorable event. If you’ve got event fundraising on the brain, you’ve come to the right post. 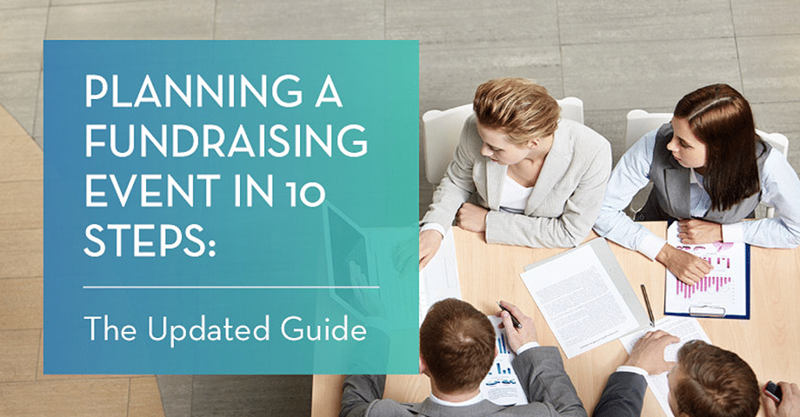 Here, we’ll walk through 10 steps to putting together a fundraising event that’s out of this world. 1. Determine your fundraising event goals. 2. Select the right type of fundraising event. 3. Establish your fundraising event budget. 4. Devise a leadership team for event planning. 5. Set a date and time for your fundraising event. 6. Market your fundraising event effectively. 7. Sell tickets to your fundraising event. 8. Set up for the big day. 9. Enjoy your fundraising event. 10. Follow up with attendees after your event. These are the ten crucial steps to planning your fundraising event—hit them all and you’ll be well on your way to a great event that goes off without a hitch. In order to host a successful event, you’ll first need to determine what success means to your organization. It’s important to quantify exactly how much money you want to bring in from this event, as that goal will inform much of your planning strategy. To find the right monetary goal, you’ll need to look to your larger fundraising strategy and figure out where an event could tie in. For example, if your event is part of a capital campaign, you might host it toward the beginning of your campaign to kick off the fundraising and inspire major donors. Promoting your cause or gaining publicity. No matter what your goals are, make sure that you have a way to quantify them. If you don’t have a metric for success going in, you won’t be able to measure how well you did or improve your strategies going forward. You’ve set at least one measurable goal for your event, such as a dollar amount you’d like to raise or a number of guests you’d like to attend. Now that you know what you’d like your event to accomplish, you’ll need to figure out what type of event will get the job done. How do your supporters prefer to get involved? Have a strong volunteer base? Consider planning an event with a community service component. Database full of text-givers? Try a text-to-donate blitz event! Where do your donors live? If your supporters are spread across the country, tying in a virtual component, like an online auction or a livestream of the festivities, would be the most inclusive move. Will weather impact your event? An outdoor fun run might draw in more attendees in the spring or summer when it’s warm versus a cold early morning in January. An indoor charity gala, on the other hand, can be hosted year-round. Does your cause have a specific demographic? If you’re raising money for a nonprofit camp or school, for example, an all-ages event such as a family-friendly cookout or field day may be more successful than a parents-only evening event. Your fundraising goals will also heavily inform the kind of event you host. For example, if you hope to attract publicity in the community, you might want to host a large, accessible event (like a walkathon or fun run) rather than an intimate gala. On the other hand, if your fundraising goal is on the higher end and you’re looking to engage with major donors, a formal dinner might be the perfect choice! Keep in mind that the type of event you choose to host will also influence the kind of venue you select. While some events (like a silent auction) work well in several different types of spaces, others require certain parameters. For example, if you’re hosting a talent show or concert, you’ll need a large stage as well as the right lighting and sound equipment for your performers. Bonus: Need some inspiration? Check out our list of amazing fundraising event ideas to find an event that matches perfectly with your audience and goals. You’ve decided on the type of event you’ll host based on your donor demographic and fundraising goals. While fundraising events can be major money-makers, let’s not forget that you’ll have to invest some of your own capital in order to make the event happen. Event planning or auction software. Tables, chairs, dishes, and cutlery. Sound or lighting equipment, if not provided by the venue. Make a spreadsheet with all the items you’ll need, and do some research to find the best deals and prices. You’ll also want to add some padding to your budget for any unexpected costs. Don’t forget to consider potential sponsors at this stage, too. If you can work with your supporters and local businesses who’d love to help, you can abate some of the expenses and build lasting relationships in the community, too. You’ve put together a detailed budget to account for all the items you’ll need, with some room for unexpected expenses. 4. Devise a leadership team for fundraising event planning. We’ve been talking about all the different elements of event-planning, but we haven’t actually specified who is taking care of all these logistics. Before you get too far into the planning process, determine who’ll be in charge of the different components of your fundraising event. Usually, nonprofits hire an executive director who helps develop different fundraising event ideas and handle the budget for various fundraisers. The executive director manages the big picture ideas and assigns roles and responsibilities to other staff and volunteers. He or she will also act as the representative for your event, meaning the individual will pitch fundraising ideas to your nonprofit’s board of directors to get the green light to start planning. Having a leader that’s head of planning means that other team members will have someone to direct questions to and they can keep your team on the right path to accomplish your goals. If you don’t already have an executive director, your nonprofit should consider hiring one to help manage your fundraising efforts. As far as the rest of your team goes, you might have a committee comprised entirely of staff with a single chairperson who takes the lead. Or, for especially large events, you might rely on multiple committees or task forces and utilize both staff and volunteers. When you plan out a leadership strategy, you’ll minimize the risk of miscommunication and mistakes and ensure that all staff and volunteers know exactly what their role will be in the success of your event. Everyone on your event team has a clear role in planning and executing your fundraising event. Before you can start booking entertainment and contacting potential venues, you need to know one more important detail: when your event will take place! Are we planning far enough in advance? Planning an event too soon will not only make it tough to secure a venue, but it will also give guests less time to RSVP. Is this an annual event? If you’re hosting an annual event, you should keep your timing consistent each year so that donors generally know when to expect it. Does our fundraiser conflict with any other major events? Keep holidays in mind as well as national or local events, from award shows to sports games. Should our event be on a weeknight or weekend? If you’re hosting a daytime event, opt for Saturdays and Sundays when donors are more likely to be free. If your event takes place in the evening, you’ll likely find a better deal on a venue on a weeknight, but donors will be less likely to stay late (especially if it’s a family-friendly event on a school night). You’ve picked a date that’s convenient for donors and provides plenty of time to finalize plans and secure RSVPs. 6. Market your fundraising event efficiently. You’ve started to pin down the details for your perfect event, but something’s missing—your guests! To get the word out to your constituents and guarantee a packed house, you’ll need some kind of marketing strategy. Print ads in local newspapers. Social media (Facebook, Twitter, Instagram, etc). All of these methods can be extremely effective, but to maximize your promotional potential and most efficiently catch your supporters’ eyes, use your CRM to find out which channels would be most effective. That way, you don’t waste time or resources creating advertisements that don’t make sense for your donors. Additionally, be strategic in how you plan out your approach to each marketing channel. For example, post a PDF version of your event flyer on your website so that supporters can print it out and spread the word themselves. Then, convert the same image to a JPG to share on social media. When you create a cohesive, adaptable set of materials, you’ll widen your appeal without expending any extra effort. You’ve put together a multichannel marketing strategy to promote your event to your supporters and community. Now that you’ve begun marketing your event, you’ll need to figure out how you’ll handle ticket sales or registrations. Will we charge a flat price or offer different ticket packages? You might sell a VIP ticket option for a higher price or offer discounts for groups or families. Additionally, you could price your tickets by date of purchase to reward those who buy early. Where will we sell tickets? Make sure donors know how to purchase tickets by providing a clear option on your event website. Clearly lay out prices and packages so that there’s no confusion. How will we manage attendee information? If you’re handling tickets or event registrations online, you’ll be collecting a lot of donor information with each purchase. 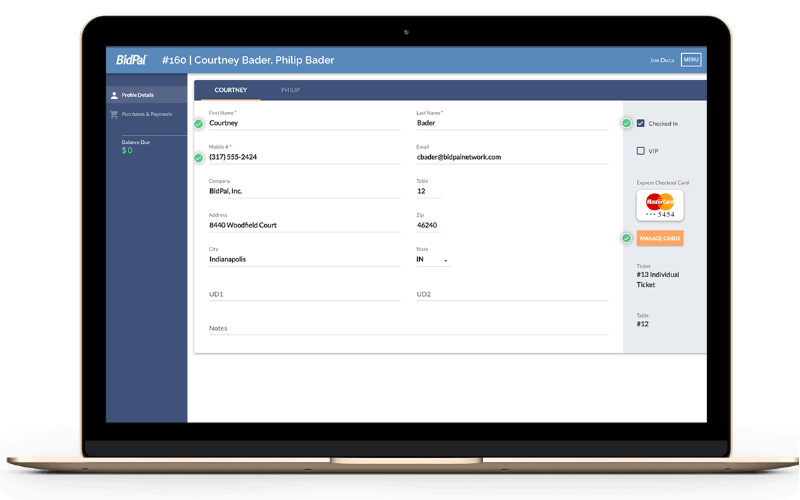 The best way to manage this data is to integrate your event fundraising software with your nonprofit CRM so that all data flows seamlessly into your donor database. Ask the user for their basic contact information such as address and email, and make it easy for them to include their credit card information. It may be a good idea to make any prompts beyond basic contact information optional, so the user isn’t turned off by a needlessly long process. If you’re not sure where to start with event registration, looking into event management software can be a good place to start. 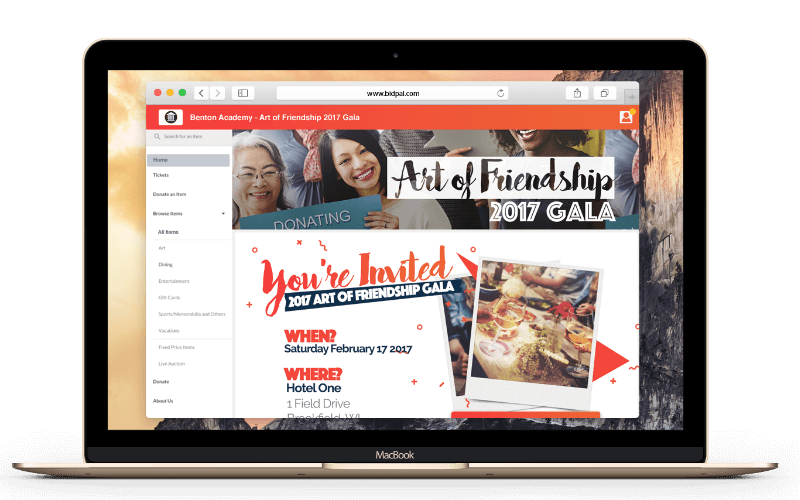 With the right tools at your disposal, your organization will be able to create and design event fundraising that captures your donors’ key information. Additionally, event management software can help you set up multiple packages (think: VIP and discounted rates) so that all your donors have an option that’s within their price range. Even better? Event management software can make checking in quick and simple. Donors can show their tickets at the donor via a printed copy or mobile phone. Bonus: The best way to streamline the ticketing process is to work with event fundraising software that makes selling tickets or setting up event registrations simple. If you’re in need of software, take a look at the OneCause solution. You have a procedure in place for managing ticket sales and collecting attendee data. 8. Set up for the bid day. It’s time to put all your preparation to the test on the big day (or night) of your fundraising event. Coordinating with entertainment (i.e., when to arrive, where to park, when rehearsals/sound-checks will take place). Arranging day-of ticket sales or registration. s to event volunteers—are aware of their responsibilities and prepared to pull off a successful event. Your event team will need to know when and where to arrive, what to wear, what tasks they’ll be performing, and how long they can expect their shift to last. Send out these details well in advance to provide ample time for answering questions or dealing with unforeseen issues. Remember: the more prep work you put in, the less you’ll have to worry about on the day of your fundraiser! It might also be a good idea to do a practice run-through with your technology and any entertainment. After all, you want everyone involved to feel confident that your fundraising event will go off without a hitch. Your event venue, entertainment, technology, and volunteers are all ready for guests to arrive, and you’ve done a practice run of the festivities just to be safe. 9. Enjoy your fundraising event! By the time the big night actually rolls around, you might be tempted to check out or consider all your hard work done. While you can (and should!) relax a little, your part is definitely not over yet! Engage with guests. It goes without saying that you should use your event as an opportunity to get some face time with donors. Check in with them and make sure they’re enjoying the event! Broadcast your event online. For those who couldn’t make it, take the party online! Livestream your event on social media or use a designated hashtag to make social engagements easy to track. Have fun! Supporters will be able to tell if your staff is stressed out or frazzled throughout the event. Show your donors how excited you are to have put together such a successful event (and how grateful you are for their attendance!). You’re excited to mingle with guests and enjoy the fruits of all your hard work and event planning. 10. Follow up with attendees after your fundraising event. The event might be over, but your work here is not. Don’t leave guests hanging after event doors close; follow up and thank your attendees for their support! You should promptly send thank-you notes to everyone who was involved with your event, including sponsors, guests, and volunteers. Don’t forget to update your supporters on your progress, too. They’ll want to know how this fundraising event impacted your cause, so be as detailed as possible. In what ways was the event successful, and in what ways was it unsuccessful? Do you think this type of event is an appropriate way to raise funds/awareness for this cause? Can you remember any specific details about the event that you feel made you more or less likely to donate? How can we make our next event better? Learning more about your donors after each fundraiser ensures that your events will keep improving and your fundraising dollars will keep climbing! You’ve closed out your event by sending thank-you notes to your supporters and creating a survey to get donors’ feedback on your fundraiser. Silent Auction Planning Guide. One of the most popular fundraising events, silent auctions can be a lucrative way to raise money and engage donors. Learn how to plan a great silent auction today! Event Fundraising Software. No event is complete without software to streamline every aspect. Check out the OneCause solution! Text-to-Give Guide. Using text-to-give is an effective way to raise money during events because donors can easily give in the moment. Learn about incorporating text-to-give into your fundraising events. Double the Donation’s 113 Amazing Fundraising Ideas. For event inspiration and more, take a look at this comprehensive list of fundraising ideas from Double the Donation.